Yahoo is closer to naming a new international head, according to sources, the last big slot left in the top management structure of CEO Carol Bartz. While BoomTown is endeavoring to get the name of this international man of mystery, several sources said the company has come close to settling on a London-based media exec, who will move to and operate out of its Sunnyvale, Calif., HQ in Silicon Valley. But it is unclear if or when a final appointment will be made. That exec could be a lot of people, since Yahoo’s headhunter for the job–Heidrick & Struggles–has pretty much talked to the gamut of international Web muckety-mucks since the search started six months ago. The many chatted up include: Former Bebo head Joanna Shields (nope, she has a noncompete from AOL); former Joost CEO Mike Volpi (nope, he just landed as a VC at Index Ventures), Microsoft (MSFT) consumer and online man in Britain Ashley Highfield (hmm, would he move so quickly after jumping from Project Kangaroo and the BBC?) and Gavin Patterson, head of the BT Retail unit. But Yahoo could also opt for a more traditional media exec, said some sources. Still, that key job remains unfilled, in an arena Yahoo has dropped the ball in recently, even as more nimble competitors like Google (GOOG) and Facebook thrive. In the Yahoo (YHOO) management chart posted below, Bartz has filled the CFO role with Tim Morse and the customer advocacy slot with Jeff Russakow. Without an international head, the three regional heads worldwide–Rose Tsou (Asia), Rich Riley (Europe) and Keith Nilsson (Emerging Markets)–have continued to report to Bartz. 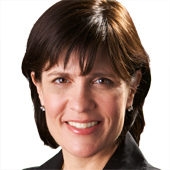 The U.S. region–Yahoo’s most significant market–is headed by Hilary Schneider.